The Networks resource tab provides a central location for users to perform logical network-related operations and search for logical networks based on each network's property or association with other resources. All logical networks in the Red Hat Enterprise Virtualization environment display in the results list of the Networks tab. The New, Edit and Remove buttons allow you to create, change the properties of, and delete logical networks within data centers. These functions are also accessible through each individual resource tab. If you plan to use Red Hat Enterprise Virtualization nodes to provide any services, remember that the services will stop if the Red Hat Enterprise Virtualization environment stops operating. Click the Data Centers or Clusters resource tabs, and select a data center or cluster in the results list. Click the Logical Networks tab of the details pane to list the existing logical networks. From the Data Centers details pane, click New to open the New Logical Network window. From the Clusters details pane, click Add Network to open the New Logical Network window. Optionally select the Create on external provider check box. Select the External Provider from the drop-down list and provide the IP address of the Physical Network. If Create on external provider is selected, the Network Label, VM Network, and MTU options are disabled. From the Cluster tab, select the clusters to which the network will be assigned. You can also specify whether the logical network will be a required network. From the vNIC Profiles tab, add vNIC profiles to the logical network as required. You have defined a logical network as a resource required by a cluster or clusters in the data center. If you entered a label for the logical network, it will be automatically added to all host network interfaces with that label. Edit the settings of a logical network. A logical network cannot be edited or moved to another interface if it is not synchronized with the network configuration on the host. See Section 5.5.2, “Editing Host Network Interfaces and Assigning Logical Networks to Hosts” on how to synchronize your networks. Click the Data Centers resource tab, and select the data center of the logical network in the results list. Click the Logical Networks tab in the details pane to list the logical networks in the data center. Select a logical network and click Edit to open the Edit Logical Network window. Multi-host network configuration is available on data centers with 3.1-or-higher compatibility, and automatically applies updated network settings to all of the hosts within the data center to which the network is assigned. Changes can only be applied when virtual machines using the network are down. You cannot rename a logical network that is already configured on a host. You cannot disable the VM Network option while virtual machines or templates using that network are running. You can remove a logical network from the Networks resource tab or the Data Centers resource tab. The following procedure shows you how to remove logical networks associated to a data center. For a working Red Hat Enterprise Virtualization environment, you must have at least one logical network used as the ovirtmgmt management network. Select a logical network and click Remove to open the Remove Logical Network(s) window. Optionally, select the Remove external network(s) from the provider(s) as well check box to remove the logical network both from the Manager and from the external provider if the network is provided by an external provider. Red Hat Enterprise Virtualization handles multiple gateways automatically whenever an interface goes up or down. Click the Network Interfaces tab in the details pane to list the network interfaces attached to the host and their configurations. The name of the logical network. This text field has a 15-character limit and must be a unique name with any combination of uppercase and lowercase letters, numbers, hyphens, and underscores. Click the Clusters resource tab, and select a cluster from the results list. 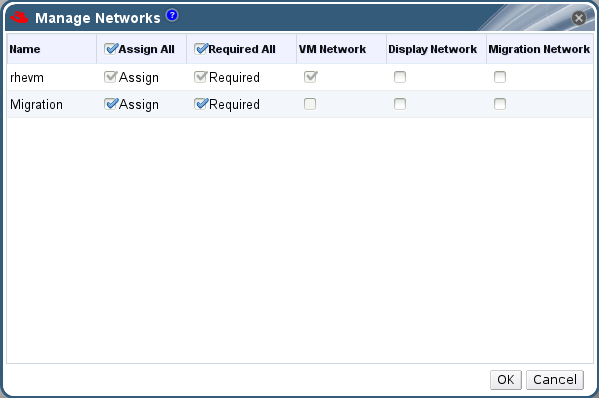 Select the Logical Networks tab in the details pane to list the logical networks assigned to the cluster. Click Manage Networks to open the Manage Networks window. You have optimized the network traffic flow by assigning a specific type of traffic to be carried on a specific logical network. A logical network marked "Migration Network" carries virtual machine and storage migration traffic. You can edit the configuration of SR-IOV-capable Network Interface Controllers (NICs) through the Red Hat Enterprise Virtualization Manager, including the number of VFs on each NIC and to specify the virtual networks allowed to access the VFs. A vNIC must have the passthrough property enabled in order to be directly attached to a VF. See Section 5.2.4, “Enabling Passthrough on a vNIC Profile”. Select an SR-IOV-capable host and click the Network Interfaces tab in the details pane. Select an SR-IOV-capable NIC, marked with a , and click the pencil icon to open the Edit Virtual Functions (SR-IOV) configuration of NIC window. Click OK to close the window. Note that the configuration changes will not take effect until you click the OK button in the Setup Host Networks window.